I hope you all had an enjoyable summer and found some time to relax. Of course although we do not hold meetings during the school holidays our Leaders and many of your sons and daughters were involved in camps. Eagle Troop and Lion troop each spent a week at Broadstone Warren in East Sussex - a great site for Patrol camping whilst Scorpions went back to Lyons Copse for a week of activity. Our Explorers spent a long weekend camping on Hayling but spending their days at Bognor Regis and the Isle of Wight. (This was so that those Explorers who work at weekends could join the others overnight). And our 4 international Explorers have some great stories to tell of their time at the World Scout Jamboree in Sweden (Matthew and Michael Kenny and Jack Golden) whilst Scott Hickman had an equally amazing time in Denmark. The recipients were (top) Daniel Byrne, George Charlton, Jacob van Baskerville, Huw Thomas, Henry Jameson, (bottom) Ben Cassidy, Curtis Chapman and Joel Masson. Rupert Jameson, Oliver Lister and Daniel Smith all from Redwood Colony were presented with their top award, the Chief Scout's Bronze Award. Alex Kinsella of Eagle Troop and Matthew Welsh of Shark Troop both received their Chief Scout's Gold Awards, the top award of the Scout section. Matthew is the first Scout in Shark Troop to gain the top award. Raven Patrol from Eagle Troop were placed 8th in the County Camping Competition. Patrols from all over the County took part in a weekend camp that tested them on their Scouting, camping, teamwork and leadership skills. The patrol, Harry Hick, Jack Kinsella, Edward Mill, Jack Rocket and Dan Allen also won a special navigation challenge for which they received the trophy being held by Jack Rocket. Congratulations to Denis Doney, Jo Hawley, Margaret Downey and Joan Roberts who each won £25 in our 100 club. Our annual Quiz Night for the Dreadnought Trophy will take place on Saturday 15th October at the Community Centre West Town. Teams of up to 8 people are invited to take part and test their general knowledge in what is always a fun evening. The cost is £8 per person which includes a hot supper and the bar is open. Why not enter a team and see of you can beat last year's champions, the team from ACE. For details see our website or contact Mandy on 92462786. Thank you to everyone who has supported this fund and helped us to continue to make good progress towards our target of £20,000. Each year, Scouts from across the world take part in JOTA and talk to each other across the radio waves. At the same time there is Jamboree On The Internet (JOTI) which is a real time connection across the Internet. This year our Dreadnought Unit have organised the event and invite all members of the Group to take part. Details are in the section pages of our website or with the Leaders. We are again holding our annual Fireworks display on Friday 4th November. The evening is open to members of Hayling Scouts or Hayling Guides and their families. The cost this year will be £7 per family and again Hot Dogs, Burgers and drinks will be available. Location details will be sent home in a letter nearer the event. We have been invited to join the Hayling Island British Legion for their annual service of Remembrance on Sunday 13th November. All Scouts, Explorers and their Leaders are invited to attend. Your leaders will provide exact details nearer to the date. Our next second hand book sale will take place on Saturday 19th November at the URC Church Hall in Mengham. If you are able to help us for just 2 hours either with the sorting or on the sale day we would love to hear from you. Please contact Phil Blosse on 92462786. This year our Xmas Card delivery service is 28 years old. You will receive full details soon but please make a note of the date Sunday 18th December for deliveries. Congratulations to Dave and Katherine. Congratulations to Dave and Katherine Hersey who were married recently in Ashford Middlesex. 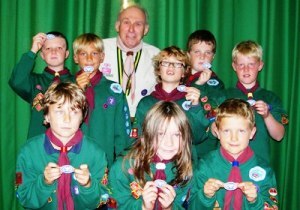 Dave a Cub, Scout and Venture Scout on Hayling continues to help Eagle Troop at camps and when he can. The reception was a bit like a reunion of current and ex Scouts from Hayling - a sign of the long term friendships that often develop in this movement. 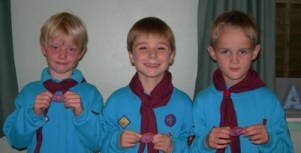 A special thank you to Sarah Dawkins and Jo Hawley who have recently taken a well deserved break from active Scouting. Sarah was one of the initial team who established Mars Pack 3 years ago and has made a significant contribution to the development of the Pack. Jo Hawley joined our Group Development Team when her eldest Son James was a Cub. After 10 years service to the group and in particular managing the "Wish List" we have allowed Jo to escape (for a while!). Thank you both for your brilliant help and support over many years. We also say goodbye temporarily to Zack Allgood (Redwood Beavers) and Liam Holden (Lion Troop) who are just starting their University courses. They will both continue to support the Group when they can but are too far away to continue with the weekly meetings. Good luck to you both.